Welcome to our new online store where you can purchase a number of clothing and drinkware products with our logo. 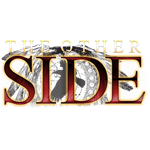 Visit the Other Side official website! A number of you have been asking for The Other Side merchandise, so here it is! We hope you enjoy this new addition to our online world. Find kids size products with the TOS logo here. Find clothing for women with the TOS logo here. Find clothing for men with the TOS logo here.